Photo courtesy of Absolute Zero Ice Cream. Absolute Zero Ice Cream assembles intriguing Thai-inspired ice cream rolls. If you are craving a brief escape from the bitter cold temperatures and a delicious taste of summertime, then be sure to check out Absolute Zero Ice Cream. It was introduced into the Montclair community in November of 2016 and has been receiving phenomenal business. In addition, the customer is given the captivating opportunity to watch their ice cream being rolled out and prepared right in front of their eyes. The owner of Absolute Zero Ice Cream was exposed to the idea of Thai-style ice cream as he was exploring ideas for his new business. He keenly decided to start his business in Montclair because he admires the town and how it contains a vast amount of opportunities when it comes to initiating a new business. “It is surrounded by many different restaurants and I just knew it is a perfect fit for Montclair,” said Cheng. 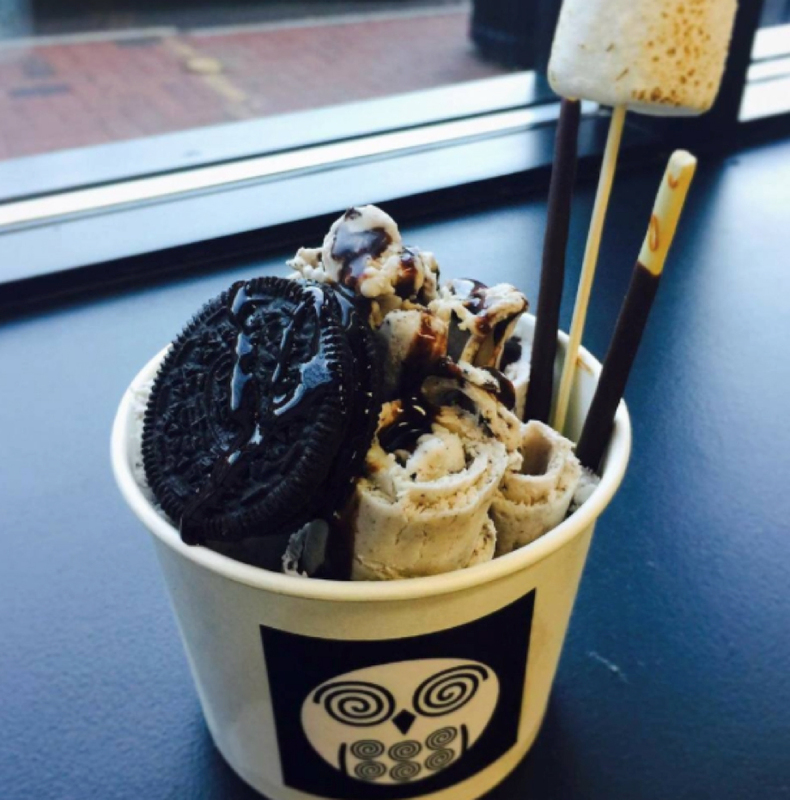 One of the most popular items on the Absolute Zero Ice Cream’s menu is “Camp and Chill,” which is comprised of chocolate rolled ice cream topped with marshmallows, graham crackers and whipped cream. Another vastly purchased item is the “Strawberry Shortcake,” which has strawberries, whipped cream, mint Oreos and marshmallows. There are also a variety of other enticing toppings that Absolute Zero Ice Cream has to offer including bananas, raspberries, coconut shavings, blueberries, caramel syrup, pretzels, teddy grahams, crushed cookies, sprinkles and chocolate syrup. Through their positive reviews and five-star ratings on the businesses Facebook page, it is evident that customers are incredibly pleased with Absolute Zero Ice Cream. As Cheng eagerly stated, “Business has been better than expected and I am glad to see happy and satisfied customers. We are fortunate to have people come and support us.” You can learn more about menu items and what they have to offer by calling 862-213-3748.